I've been slippin lately, this news went right by me. Graffiti writer/artist/musician Rammellzee died on June 27th after a long illness according to his wife Carmela Zagari Rammellzee. One of the earliest (if not THE earliest) graffiti and Hip Hop artists, Rammellzee performed in self-designed masks and costumes that were truly unique and out of this world. His vocal styles was as much of an inspiration to MCs as his art was to graffiti writers. He was the founder of Gothic Futurism, a school of thought where "the battle between letters and their symbolic warfare against any standardizations enforced by the rules of the alphabet." He later expanded this idea by making his graffiti letters into sculptures, like armored vehicles, a style & philosophy he dubbed “Ikonoclast Panzerism.” His song "Beat Bop" (which was produced by legendary artist Jean-Michel Basquiat) was featured in the early Hip Hop documentary "Style Wars" which was my first exposure to the man. 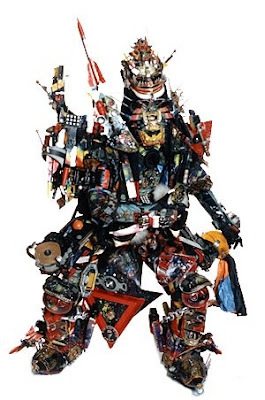 He also had a small part in the 1984 Jim Jarmusch movie “Stranger Than Paradise.” Rammellzee was a one of a kind figure that inspired Hip Hop and the world around it.